Tarun Gupta March 12th, 2013 Link Building no comments. In the SEO world of 2012, content has already proved significance and even in 2013, we are expected to see the same pattern. Content marketing has definitely emerged as the most indispensable element of search engine optimization. And, a very interesting and popular part of content marketing that has redefined its existence is Guest blogging. Guest blogging services are widely used by online brands to strengthen their online credibility and to build quality links. However, unfortunately, some inexperienced SEO professionals abuse this practice by using low standard guest posts or by linking to irrelevant guest blogs. To add to their misery, Google is actually attempting to take note of such low quality guest posts and disallowing them to take any SEO advantage. You must remember that guest blogging is not there to increase your link count, instead it is an extremely valuable component required for your overall content marketing SEO program. Let us now focus on some ways to ensure that your guest blogging program is there to add on to your brand's credibility and not just links. Every guest blog is a major attempt that should be treated correctly in order to make the most of it. Industry expert bloggers write about multiple things, and their grip on each topic varies. For instance, a social media services expert may not have as strong hold on Twitter marketing services as he may have on Facebook ad marketing services. Hence, one should be picky and cautious enough to accept content as guest blogs. 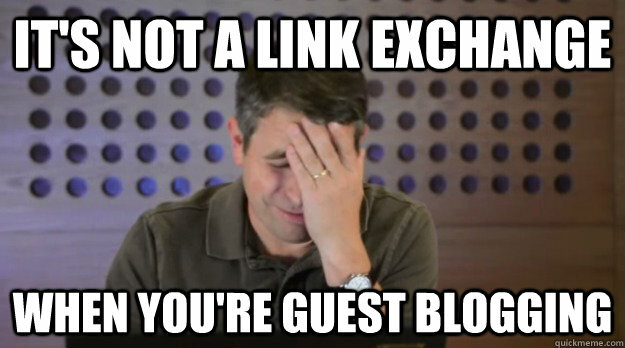 It is not essential to accept every guest blog that comes to your way. Remember that your blog is your house and you wish to decorate and maintain it with quality content only. Do not let your readers find low-quality or irrelevant content on your website as it may hamper your own reputation and drive visitors away. Secondly, all your blog posts get indexed by the search engines, so ensure that all your blog posts are in sync with your website's content marketing and ongoing SEO services. When you allow a guest blogger to do a post for your product or service, you actually endorse them. In addition to giving them a link or two , you also promote them on the social networks. This way you give them a double boost of search engine optimization and social media. Also, you promote them personally and introduce to visitors and readers who trust your credibility as an industry expert in the market. Hence, it is important to introduce your audience to guest bloggers who are good writers and experienced professionals. Also, you must ensure that their blog posts are in sync with your product and services. Your website should have a guest blog feeds from some of your regular bloggers. This enables the way for building a relationship between your readers and your guest blog writers. Comments and regular interaction will increase the overall interactiveness of your blogs. Your readers will appreciate the fact that they are actually getting an opportunity to communicate with an industry expert. Also, they will acknowledge your brand's relationship with industry experts who write guest posts for your blog. Guest blogging is an integral element of content marketing and hence, should not be overlooked at any cost. In addition to these, there are many other tips on guest blogging services that we can educate you with. All you have to do is to keep a tab on our posts.